Today we’re heading into the City of London (London’s financial district) for a tasty takeaway. Chamberlain’s of London is in lovely Leadenhall Market, one of the oldest markets in London dating from the 14th century. It was originally a meat, game and poultry market and stands on what was the centre of Roman London. The ornate green, maroon and cream roof structure was designed in 1881 by Sir Horace Jones who was also the architect of Billingsgate and Smithfields Market. It’s a unique and pleasant space, and one that I had shockingly never visited until today’s visit. Love that there’s always somewhere undiscovered to explore in London. The market is home to a range of pubs, shops and restaurants. I did think it looked vaguely familiar despite having never been there – and then I read it was used to represent the part of London near the Leaky Cauldron and Diagon Alley in Harry Potter and the Philosopher’s Stone. That would be why, I have seen that move more times than I’d care to admit. Chamberlain’s of London’s four-generation family fish business started with William Stedman in 1940. He was a porter in Billingsgate market. 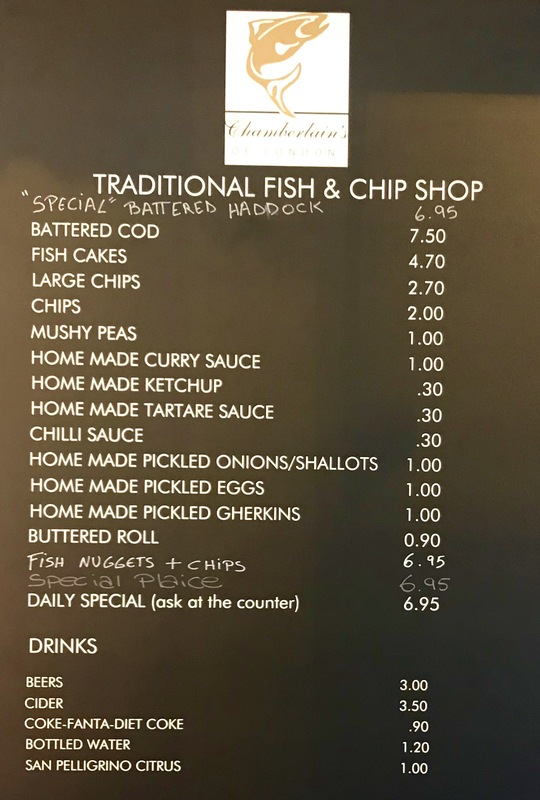 The restaurant was opened in 2001 and the takeaway fish shop is their latest addition. The fresh cod and haddock is UK-fished (often from Peterhead in Scotland) and comes via Billingsgate just down the road. The menu is simple with a choice of cod and a couple of specials daily (today plaice and haddock). 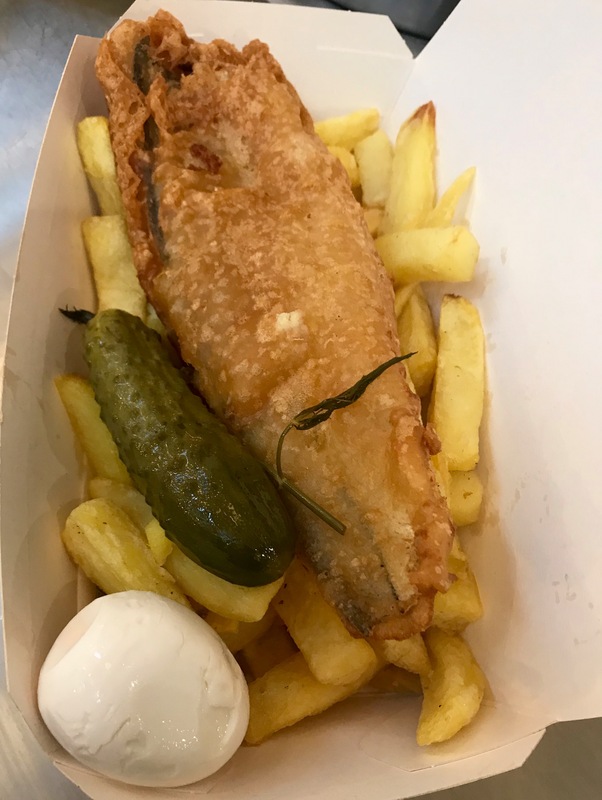 And then there’s all the usual extras like mushy peas, home-made tartare sauce, ketchup and vinegar and home-pickled gherkins, shallots and eggs. 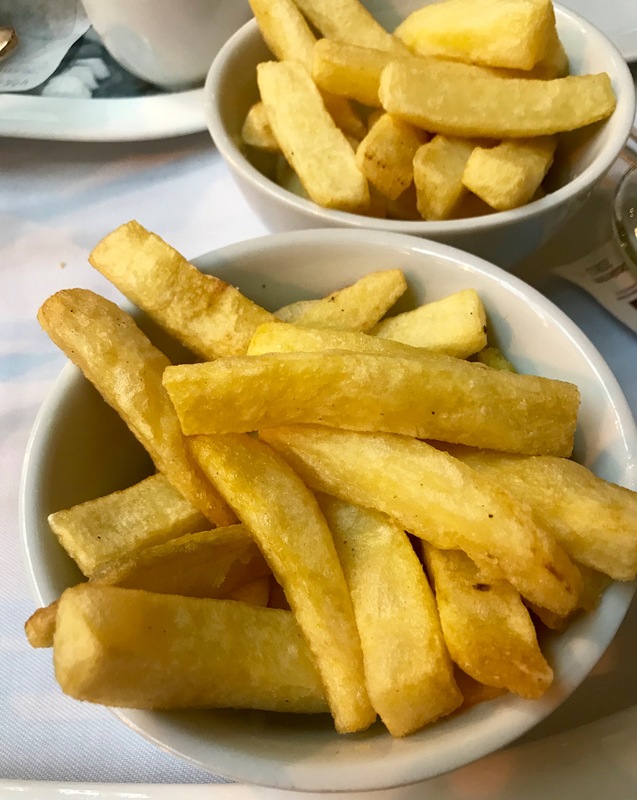 You can taste that these are all made with love – and they lift the classic fish and chips, making it an even better eating experience. I love mushy peas and these were clearly made from scratch and were topped with a drizzle of mint sauce – lovely. The home-made vinegar was distilled from beer and had a delightful sweetness and zing. And the pickles were…well, pickley. 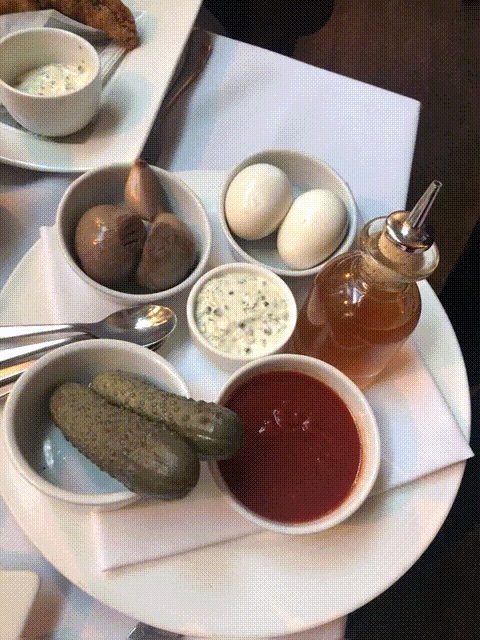 I introduced my dining companion Jules to pickled eggs for the first time and she liked them! It’s been a while since I tasted one and I can’t say I was looking forward to the experience – remembering my last encounter as not great – but I was pleasantly surprised. 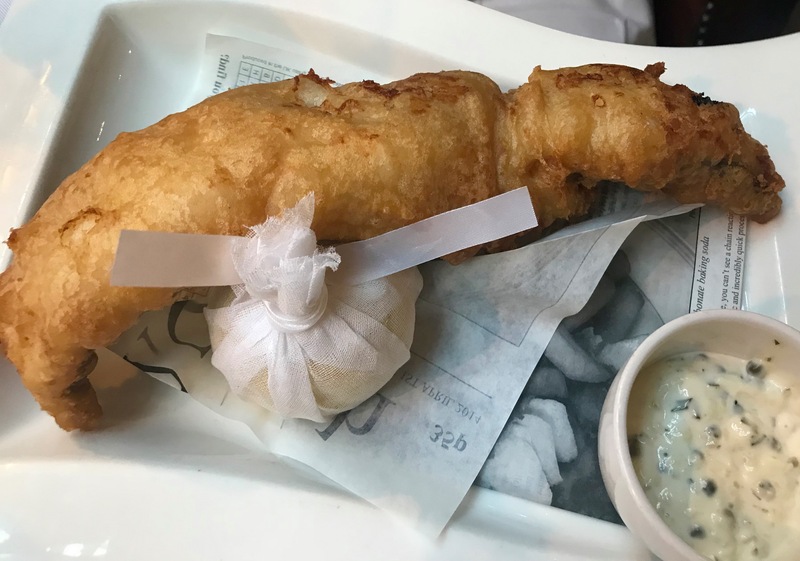 The cod was particularly tasty, beautifully plump, juicy flakes in a light and crisp batter. And all the extras added up to a highly enjoyable experience. 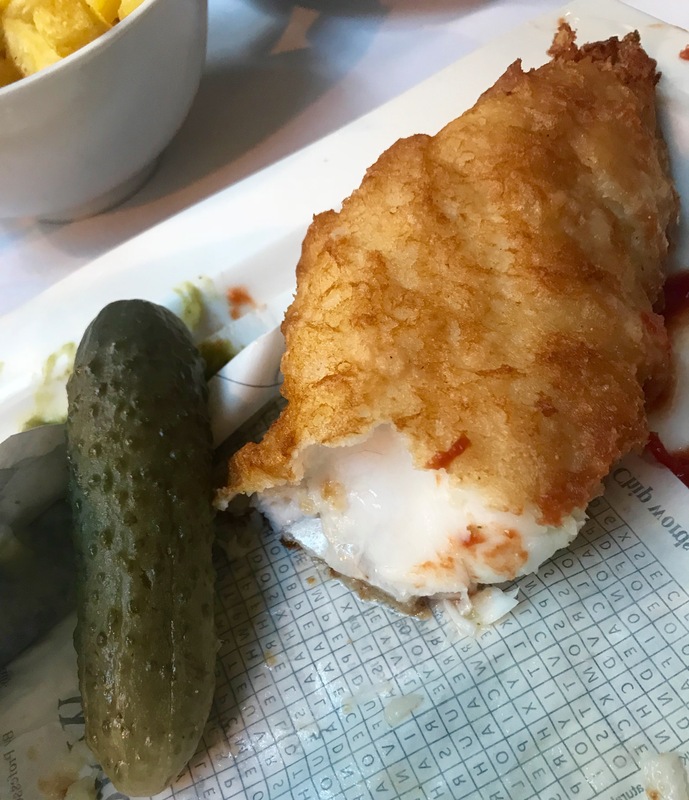 A substantial portion of cod and chips with three pickles, mushy peas, ketchup and tartare sauce will cost you £13.80. There’s a lovely seating area outside the shop under the protective roof the Leadenhall Market. 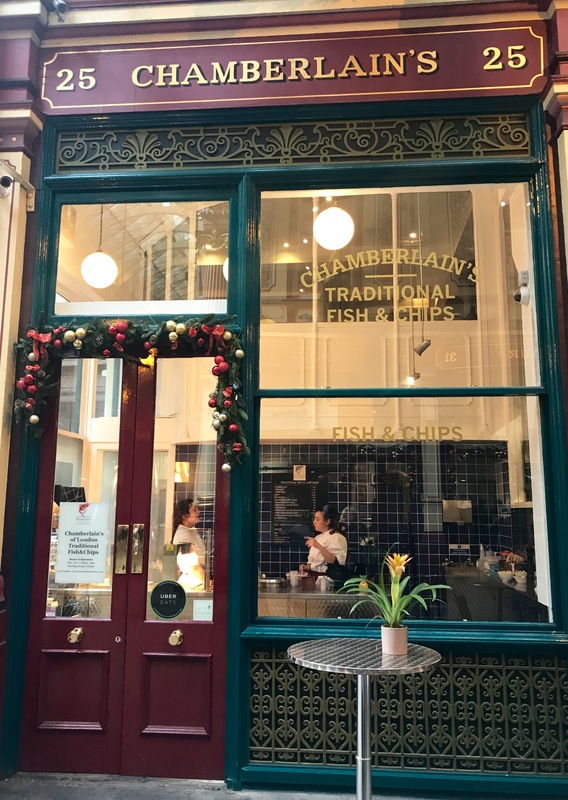 Chamberlain’s of London is at 23-25 Leadenhall Market, London EC3V 1LR.